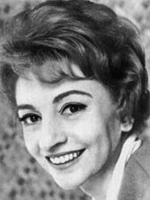 Ms Blackburn appeared in a number of TV Soaps including As the World Turns and Dark Shadows, and wrote for All My Children. Clarissa Blackburn! Okay, as soon as I read that she had starred in "Dark Shadows," it finally hit me. She played Mrs. Johnson, the Collins family maid! Only, in that series, she went by the name "Clarice Blackburn." Curiouser and curiouser.